Lab-Aid is a Laboratory Information Management System (LIMS) package which supports the standardization of quality management operations - reducing costs and improving service capabilities to your customers. Our Lab-Aid solution supports the quality management and testing departments in manufacturing and service oriented companies, with successful implementation in several sectors such as water treatment, environmental, food/beverage, pharmaceutical, medical equipment, oil, chemical, and many more. As customer quality requirements increase, and manufacturers continue to globalize their operations, the scope of quality management is becoming more complicated, extending beyond the boundaries of the standard supply chain. Company-wide quality management systems are becoming a standard requirement to maintain and improve customer satisfaction. 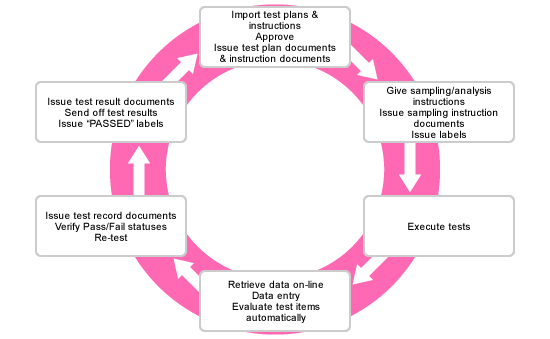 Lab-Aid provides inspection process workflows from the test plan/request and the issuance of test results, through to delivery approval, and improves operational efficiency, and quality of test data, through automated data collection, automated calculation, automated specification judgment, and automated form creation. Reduced paperwork, errors, workload, lead time, cost - Enhancing the reliability of laboratory information and creating seemless work with other departments.